A trainee accountant discovers Kate Middleton’s face on a jelly bean. The monster slipper-up: Tom Boddington receives a huge slipper after manufacturer misreads a decimal point in the required size. 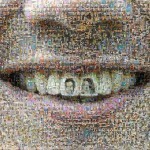 They are among the agency’s most successful and recognisable PR stunts of 2011 and 2012. 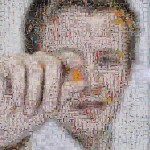 Now the images which featured so prominently in the media have been transformed into these stunning mosaics. They were created using a total of 4,300 individual tiles featuring the newspaper coverage we secured or accompanying photography. One shows the infamous Bristol tradesman who had Prince William and Kate Middleton tattooed onto his front teeth to mark the Royal Wedding. 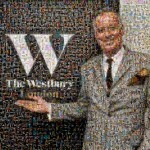 Another shows the agency’s former client, Michael Barrymore, at a celebrity event at The Westbury Mayfair Hotel in central London. And a third features Tom Boddington sitting in the 7ft-long slipper he received after the manufacturer misread a decimal point in the order and delivered a size XXXXXXXXXXXXXXXL. The fourth shows the trainee accountant who discovered Kate Middleton’s face a jelly bean. We plan to create more mosaics in coming days, which will be uploaded the Palamedes PR Facebook page and to our other social media accounts.